Conquer Casino is definitely the type of place that's up for a challenge. And it seems they've set themselves the goal of being a casino that's dedicated to offering it's players a whole range of choice. From picking a software provider to picking a payment method, Conquer Casino's players will be inundated with options at every turn. And they're not stopping there. There's a huge amount of weekly promotions on offer too and a sizeable 100% match deposit bonus up for grabs. The mobile app is flawless and there's a respectable 99 titles available straight from your handset. Conquer Casino has been around for over a year, although they've recently made some changes which have caught our eye. Powered by ProgressPlay, the site offers a complete casino experience straight from their mobile app. There's no download necessary, just add the app when you access the website, which means the casino runs perfectly across all sorts of devices. The interface is easy to navigate and the design is modern and fast to load. In terms of games, Conquer Casino are pulling out all the stops, with just shy of 100 titles on mobile from a range of popular software developers. There's great games from Microgaming, Next Gen, Thunderkick and more. There's also a healthy amount of card games, including roulette and blackjack, and there's some very tempting progressive jackpots on offer too. Powered by Progress Play, Conquer Casino has a huge amount of games on offer. There's over 200 slots on their browser site, and more than 100 available on mobile. Progress Play are known for reeling in the big names, and with titles from the likes of Microgaming, Next Gen and Thunderkick, Conquer Casino is no exception. For the thrill seekers there's progressive jackpots, and for those who aren't so keen on slots, there's plenty of table games on offer too. Microgaming are the site's main provider and this means you can find all those blockbuster slots you know and love. From Bridesmaids to Game of Thrones, these are slots packed full of characters and film references. Other popular titles include Next Gen's Psycho slot, the Foxin' Wins series, Gorilla Go Wild and Thunderkick's excellent Esqueleto Explosivo. For added excitement, Conquer Casino also host a good range of progressive jackpot slots, including the enormous Thunderstruck II and King Cashalot. And if slots just aren't really your cup of tea, then don't feel as though you’re missing out. Conquer Casino have a great range of both table games and live dealer games to satisfy your needs. There's plenty of Roulette and Blackjack varients available on mobile for card game fanatics and, although they're only available on desktop, the live casino rooms run amazingly well. Conquer Casino are offering players three deposit matches that add up to a total of £800 in bonus funds if you deposit maximum amounts. A general sign of a great welcome package is a sort of three pronged attack; a no deposit bonus, a deposit match bonus and some extra spins thrown in too. This is why Conquer Casino's offering falls a bit short. We're disappointed to see that there's nothing on offer which allows players to test run the casino before depositing. On top of that, there's no extra bonuses on your second and third deposits either. Still, £800 is definitely nothing to turn your nose up at, although we think they could up their game in this department. We'd be able to overlook this less-than-great bonus if it was at least subject to low wagering requirements. However, as these are set relatively high (50x), it leaves us wondering what's the incentive for new players? At least then, what Conquer Casino lacks in welcome bonuses it makes up for in other weekly events. This is a casino with a penchant for promotions, and they're offering players a huge amount of chances to land some extra cash throughout the week. However, don't bother trying to find information about these promotions on desktop. The promotions pages on the browser site and the mobile app don't exactly add up and, in fact, a lot of these great deals aren't advertised via the desktop site. We've spoke to Conquer Casino and we can assure you that all are available, so we think they're missing a trick by not shouting about them more. Conquer Casino is a site that isn't packed out with flashy signs or gimmicks. They're a straight-forward, no fuss casino at heart, and their VIP scheme follows suit. Whilst some loyalty programs promise the earth, Conquer Casino have made a package that's rather attainable for every type of player. As soon as you sign up, you'll join the Bronze level and you can the progress all the way up to Diamond. VIP status comes with added perks and extra prizes. All players are offered the opportunity to convert VIP points to cash, and by accessing higher levels you'll be awarded special prizes, birthday presents and your very own VIP account manager. Points are obtained every time you play with a converting ratio of 1 VIP point to every £16 wagered. Banking at Conquer Casino couldn't be easier, as they've adopted a plethora of payment methods to suit everyone. From mobile billing to prepaid cards, Conquer Casino have really pushed the boat out to make sure everyone is catered for. We must also note how impressed we are by Progress Play's move to adopt Pay by Phone as a depositing method at all of their casinos. At Conquer Casino you can deposit via VISA, VISA Debit, VISA Electron, VISA Delta, Mastercard, Maestro, JCB, Solo, Switch, Diners Club, Discover, Neteller, Skrill, Paysafecard,iDeal and Pay by Phone. All deposits are processed instantly, so the funds should be straight with you. There's no fees to be incurred via any method and the cashier page works great in app and on desktop. Minimum and maximum deposit limits vary dependent on the method you choose so it's a good idea to check with customer services before deciding on how you'll fund your account. It's worth noting that due to third party restrictions, any accounts funded by Pay by Phone will have a £30 daily limit. Withdrawing at Conquer Casino is just as easy as depositing, although you may be restricted on how your funds are given back to you. Players can choose to receive their withdrawals via Debit/Credit card, bank transfer, cheque or through an e-wallet service like Neteller and Skrill. There’s a minimum withdrawal of £20 when using an e-wallet service, £20 for credit/debit cards, and £50 for wire transfers. You can withdraw up to £1500 weekly and £3000 per calendar month. Using an e-wallet is by far the fastest way to withdraw with only a 1 day processing time. On the other hand, cheque withdrawals are significantly slower with up to a painful 28 day wait. At Conquer Casino, players can choose between contacting the site via email or live chat. You can email the casino at any time of day, although they're not specific about how long they'll take to respond. However, if there's a pressing issue, you can contact the live chat support team instantly at any time between 6:00AM and 23:00PM. We're disappointed to see that there's no phone number available. When a casino offers a hotline number it not only offers players the chance to speak to a real human being, but it gives the casino a transparency that email or live chat can't beat. That being said, when we used the live chat feature the support staff were well informed and quick to respond, so if a problem arises this may be your best means of contact. Want to play at Conquer? Conquer is a modern mobile casino with a £800 bonus package and 100+ slots! 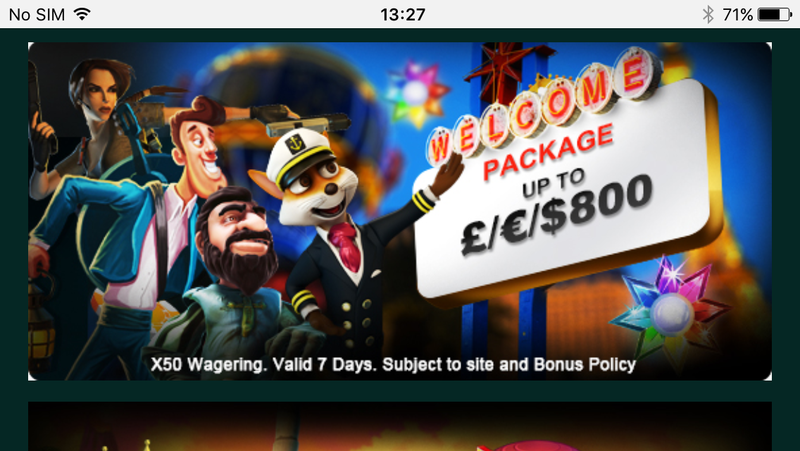 Claim £800 in deposit bonuses! Conquer Conquer Casino is the type of site where you can get straight down to playing and know that you're in good hands. There's nothing overly unique about the site although it's easy to navigate and does what it says on the tin. The mobile app works flawlessly across devices and is designed to make players' lives just that little easier - all the information you need is right at your fingertips. We were disappointed with the welcome bonus and think they could do more to appeal to new players, however they do excel in other areas so we can't really hold it against them. The great range of promotions is definitely appealing, as is the huge amount of great games on offer. With great customer service and mobile billing options to boot, it's definitely worth checking out and with some small tweaks it could be set to grow into a great place to play. NextCasino Cruise Offers £10,000 Throughout June! Rizk Mobile Casino Review — Great Risk But Great Prizes!